Say beef bourguinon and we instantly think of American cooking icon, Julia Child. Of course this moreish French beef stew way predates the quirky Ms Child, but she did a lot to introduce this Gallic delight to the rest of the world. 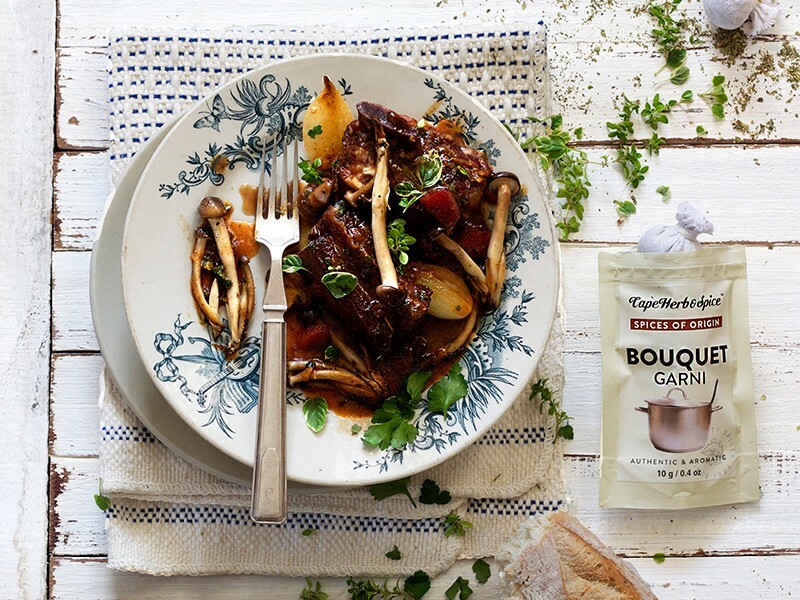 For a dish (and we’re not just talking beef here) to use the term ‘la bourguinonne’, the presence of four things is required: red wine – and a fair amount of it, plus a garnish of mushrooms, pork lardons and baby onions. That sounds pretty fine to us, so that’s exactly what we did. But instead of Pinot Noir – the red wine of Burgundy most associated with making bouguinon – we used good old South African Pinotage. After all, it is the love child of a marriage between Pinot Noir and Hermitage (aka Cinsaut), so we thought why not? And we used fabulously thick chunks of short rib instead of the more usual chuck. It’s an indulgent dinner party winner, perfect for seeing one through the last month of winter and into early spring. Lightly dust the short rib with salt and pepper (our Cape Herb & Spice S&P shaker is perfect for this) and fry it in 4 tablespoons of olive oil until nicely browned. (You’ll need to do this in batches so the casserole’s temperature remains high enough to caramelize the meat.) Set aside the meat and add the onion, celery, carrots and a third of the bacon to the same pan. Fry for a few minutes, stirring to lift all those lovely caramelized bits from the bottom of the pan. Stir in the flour and cook whilst stirring until it disappears into the vegetables. Now add the garlic and tomato paste and fry for a further minute. Once done, remove the bouquet garni and taste for salt. You will definitely need to add salt, but how much depends on the sodium content of the stock you used. Brown the baby onions and bacon in a knob of butter. Wipe the pan clean and also brown the mushrooms in a knob of butter. (Button mushrooms are traditional, but we also added some pretty exotics.) Scatter the bacon, mushrooms and onions over the beef bourguinon and, for a pop of colour, give it a sprinkling of chopped parsley. Serve with crusty baguette or creamy mash. This recipe serves 4 people handsomely.